ST JOE'S EAGLES, WE GRAB YOUR ATTENTION, YEAR AFTER YEAR, ABSOLUTE...PERFECTION!! Every cheerleading team dreams of it, but few will ever achieve it! A season of absolute perfection! Where every competition you enter ends with "And the winner is...you!" Well all 3 of our teams have achieved this amazing accomplishment! What these girls did in a few months will be remembered for the rest of their lives. This page is a look back at their seasons of absolute perfection!! 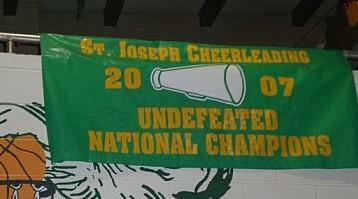 In 2009 our Biddies became the final team at St Joe's to have a perfect season! Comprised of girls in Kindergarden to 2nd grade, they were continuously put up against older teams & yet they kept coming out on top. What a great year for our little ones, and thank God we have MANY more years with these little champions! The Varsity team did it again! A perfect 6 for 6 in 2007! After racking up the wins at locals & bringing St Joe's their first National title, the varsity team put out one more outstanding performance to win by 47 points in the parish/rec division at Great Adventure! These young ladies brought it each & every week & despite having to compete outside the CCCANJ league, made it our most successful season ever! It's been an incredible journey-from the Nets game, to Nationals, to this-another undefeated season. We're losing 6 incredible cheerleaders to graduation, but there are over 20 returning to keep the winning ways going. In the past 3 years, the varsity has won 16 out of 17 competitions, with one 2nd place finish. What an amazing run!! Varsity Team: 1st place & highest score of the entire competition! Varsity Team: 1st place National Champions! Varsity Team: 1st place & highest score of morning session! Varsity Team: 1st place & Grand Champions! They did it again! An absolute perfect season. This year had a little bit of everything...we started out with the Nets game, won a National Championship, cheered our boys onto an exciting come from behind tournament win, a wonderful banquet, six wins, and a fun filled day at Great Adventure! Unfortunately, we are graduating 6 incredible cheerleaders, and they will be missed very much! Tori, Vanessa, Stephanie, Kiersten, Cyre & Megan-we'll miss your basing skills...and your 4 standing tucks! Just when we thought another undefeated season would be impossible, our JV pulled it off in 2006! Their final win at Corpus Christi made them an absolutely perfect 5 for 5! You girls were truly amazing all season. All of the coaches & other cheerleaders want you to know how proud we are of you! Thank God you are all so young & have many more seasons with us here at St Joe's! Great job ladies...Congratulations!! Our JV girls swept all 6 divisions at St Cecelia's, and then swept up again at Corpus Christi to end the season! Thank God they're all so young & still have many years here at SJS!! The Varsity squad completed their perfect season at the Cheer & Dance Championships at Great Adventure! The weather held up, and the Varsity Eagles took control of the floor for the 6th time in 2005. The new pyramid popped up perfectly, helping to give the team their final win of the season. We were up against teams from the rec division, and out of state, but the girls took to the floor with full confidence. This was the perfect ending to the perfect season, and we could not be any prouder of the 24 girls who made up this team. Afterwards, we were able to ride the rides & have a great time. Our win actually gave us the opportuntiy to give back, as we won a monetary award that we will be donating to one of our parish's charities! Thank you ladies...it has been an absolute honor! Thanks & goodbye to our 8th graders! Every graduating class likes to go out with a win, and you went out with 6 in a row! Arielle, Heather & Erica, you did a fantastic job as captains this year. We have watched some of you grow in our program since Biddies or JV, and some we just met this year, but all 11 of you have a special place in our hearts! If you cheered all 3 years of Varsity, you won 10 competitions! That's incredible! And you ALL placed either 1st or 2nd in your single/double/stunting group this year! Wow! Just know that you will be missed terribly & the doors of the gym are always open! Erica G, Erica S, Sasha, Natalie, Arielle, Heather, Jessica, Briana, Kim, Taylor & Kristen B!